Besides normal Google Account support, GQueues also allows you to login with a G Suite account and integrate with your G Suite calendar, drive and contacts. What is a G Suite Account? G Suite allows businesses, schools and other organizations to use customized versions of Google products (email, calendar, contacts, docs, etc...). You can get a domain name, such as example.com, and then setup accounts in G Suite for the various people in your group (me@example.com, you@example.com, etc....). Then you can check email in a product that looks and works just like Gmail, except that it's for me@example.com instead of me@gmail.com. Calendar, Docs and all the rest are also tied to your me@example.com account. 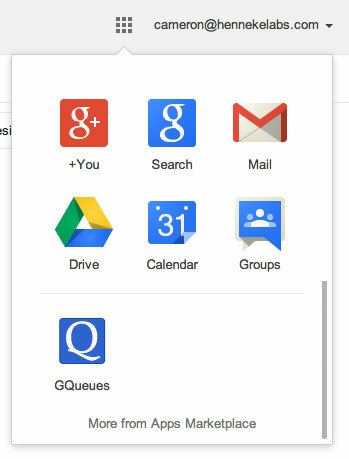 GQueues allows you to login with your G Suite account (me@example.com) instead of having to create a separate Google Account. When you activate Calendar, Drive and Contacts integration, GQueues syncs with your G Suite Calendar, Drive and Contacts instead of the normal Google Calendar, Drive and Contacts. 1. On the home page, click the normal Sign In button. 2. Enter the full email address of your G Suite account, your password and click Sign In. 3. You are then redirected back to GQueues and signed in with your G Suite account. If you sign in to GQueues with your G Suite account and activate Calendar, Drive and Contacts integration, GQueues uses your G Suite calendar, drive and contacts. This makes it easy to share queues with others in your organization and sync with your work schedule. You can add GQueues to your G Suite domain to make it even easier to manage your tasks. Once installed, GQueues will appear in Google's app menu so anyone on your domain can get to GQueues quickly, without having to re-login. When you install GQueues on your domain, the admin can grant GQueues access to Calendar, Drive and Contacts for all users on the domain. This eliminates the need for individual users to grant access and makes it easier for people to share queues with others and sync with their work schedule. Installing GQueues on your G Suite account is FREE and highly recommended. Click this button to start the installation. Once installed, GQueues will appear in your Apps menu for easy access. Installing GQueues on your G Suite domain is FREE and highly recommended. If you are a G Suite Admin click this button to start the install process. 1. Go to the GQueues listing in the G Suite Marketplace and click the INSTALL APP button. You may be prompted to sign in with the admin account for your domain. 2. Agree to the terms and click the Accept button to allow GQueues to integrate with your domain. GQueues will now appear in your list of Marketplace apps in your Admin Console. NOTE: It may take an hour or so before GQueues appears in the apps menu for all users on your domain. 1. 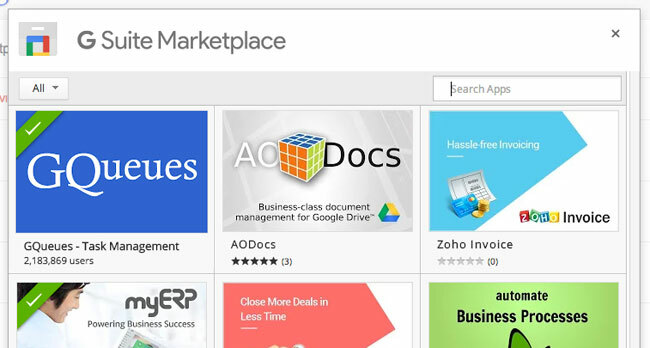 Login to your G Suite Admin Panel at https://admin.google.com and click on Apps and then Marketplace apps. 2. Click the Add Marketplace Apps button at the top right. 3. Click the GQueues listing in the Marketplace. 4. Click the INSTALL APP button. 5. Agree to the terms and click the Accept button to allow GQueues to integrate with your domain. If you are ready to purchase GQueues for users on your G Suite domain you can buy a GQueues for BUSINESS subscription and receive a volume discount. Read more about GQueues for BUSINESS to get started. Follow the steps below to uninstall GQueues from your G Suite domain. This will NOT delete your GQueues account or any of your data, it just removes GQueues from your domain so it no longer shows up in the apps menu. 2. Click the GQueues app name. 3. Click the Remove App button. 4. Confirm the app removal. When you install GQueues on your G Suite domain you explicitly authorize GQueues to access your users' Calendars, Drive and Contacts. If data access if revoked then GQueues' Calendar, Drive and Contacts integration will stop working for your users. 3. Click the Data access section and then Grant data access.